The men’s restroom has a pink colour scheme. When you enter the VivaKi office, a holding company that brings together digital and media services, you know it’s a space where ideas are given form and converted into design and products. It’s housed on the ground floor of a three-floor commercial complex in Mumbai’s Kanjurmarg area, and ideas come at you from every direction the minute you enter—starting with the rusted wall at the entrance. Rust, to VivaKi, represents inclusiveness and openness to change, and that’s how they would like to describe the organization—a workspace that is all about change and new ideas. The reception area opens to a large, common recreation space, next to which is the main conference area called Hive Central, with four conference rooms collectively called Hive Express. The rest of the space is divided into mini offices for nine companies, which provide services such as media planning, media buying and rural marketing, all under the VivaKi umbrella. Kaushik Chakravorty, country head, Enhance (the retail branding wing of VivaKi), asks us to imagine a beehive. “Many times a single client hires all the services that we provide. So we are separate parts working towards a single goal," he says. And that is what they wanted reflected in this workspace—many parts coming together as a whole. 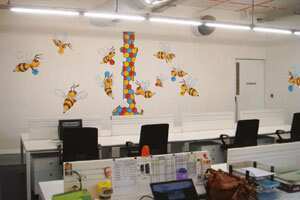 The bee motif recurs in the artwork across the office. A 120ft-long bright orange shelf divides the office into two parts and serves as a library wall. “We elevated the library to give another viewpoint to a space that’s flat," says Sanjeev Punjabi of Spasm Design, who designed the space with his partner, Sangeeta Merchant. On either side of this wall are the individual work areas of the nine companies. “Since there are different allied offices that need to be housed within one space, they wanted us to make sure that they all retain their individuality even while blending into a single working group," says Punjabi. So every company space has its own colour scheme and graffiti. 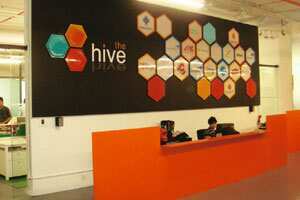 The graphic behind the reception area introduces the concept of The Hive. For Punjabi and Merchant, who had worked mostly on residential projects, this was their first experience of designing a big office, and they were given a free hand. “We wanted to challenge all norms and came up with all kinds of ideas. And the company heads were receptive," says Punjabi. In a major departure from the norm, they decided to “almost showcase" the restrooms. These are located centrally, right next to the conference area, instead of being tucked away in a far corner. Given the drainage system provided by the builder, they didn’t have the option of moving the restrooms elsewhere. The central space was also the logical location for Hive Central. Hive Central is designed to look like a railway station, with four conference rooms collectively called the Hive Express; each room, or bogey, is numbered—H 1-4. The recreational area faces the Hive Express. Another quirk is a gender bender in the restrooms: The men’s room has a pink colour scheme and the women’s, blue. The walls are cheerful, with graffiti by students of the Sir JJ Institute of Applied Art, Mumbai, who were also asked to come up with concepts for five other walls, as well as the cafeteria. Bees popped up naturally as a theme to signify The Hive. 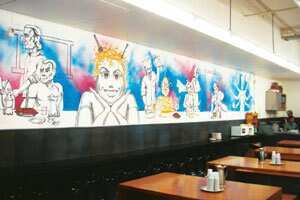 The cafeteria walls are covered with graffiti designed by students of the Sir JJ Institute of Applied Art, Mumbai. The recreation space has been made multifunctional with hydraulic jacks that simply move the platform, normally set with a pool table and beanbags, up to the ceiling when a meeting is to be held. The floor below is lined with chairs that are otherwise tucked away in cupboards, and a screen is pulled down for videoconferences. “If this function can be used to move cars up and down in parking lots, then we thought we could do this here as a space-saving measure," says Punjabi. The individual company offices have an open plan, with workstations and glass cabins for the management. Access to each office is controlled by access cards and not everyone can enter every company office space. “We made the space, but the way these guys grew into it is even more interesting. 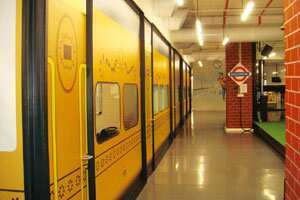 They personalized it by giving it a name and their ideas like Hive Central took it to another level," says Punjabi. Bulbs are great in beds and containers, and that’s where we traditionally plant them. But have you tried them in your lawn? Think home-grown Alpine meadow: Plant small flowering bulbs such as crocus all over the lawn. One tip: They are fun to dot around arbitrarily, but planting them to plan makes mowing the grass less of a challenge. Iris, anemone and snowdrops are great lawn bulbs as well. Gladioli, ranunculus or clivia are far too tall for a lawn. But you could put a few in pretty ceramic or terracotta planters: When the bulbs bloom, you can shift the brightness indoors. The patch of grey sunflowers, glistening under the tropical sun, is arresting. A small note next to the plastic flowers explains that the art installation, by Singaporean art collective Vertical Submarine, refers to Chien Swee-Teng’s poem about a sunflower plantation owner’s Faustian pact: He gives up his sense of colour for the success of his business. But there is more to it than meets the eye: There is no Chien Swee-Teng, no poem—the collective invented the writer and his poem about avarice. The work, ‘Planting Shadows’, is part of ‘Nature Borne’, a sculpture exhibition running until 27 December at the Singapore Botanic Gardens. A combination of primary rainforest and speciality gardens, the 52ha park on the edge of the main shopping belt hosts works by 10 artists, five Singaporeans and five Koreans as it celebrates its 150th anniversary. Parragon Publishing India’s four-book series ‘Great Ideas’ (Rs295 each) is a good place to begin your own interior projects. If you are planning to do up your children’s room, ‘Great Ideas for Kids Rooms’ has plans for all ages, from infants to teenagers. And ‘Tiny Apartments’ can ease the pinch of shrinking urban spaces, with its guide to making undersized apartments feel spacious or cozy, depending on what you prefer. The book on ‘Storage Areas’ has solutions for both living and workspaces, and the one on ‘Bath Rooms’ should help you remodel or decorate the smallest room in the house. Choosing between a striking or subtle pattern for a rug can be tough. Best-case scenario: It brings a room’s disparate parts together. Worst case: It draws the eye downward for all the wrong reasons. And it’s not as if you can sweep the rug under the...rug! But a bold carpet instantly anchors the room and gives you a strong colour scheme to work with. An extremely versatile option is the cotton Zig Zag Rug created by renowned rug designer Madeline Weinrib in 2001. The strong black and white chevron pattern is handwoven in India (other colours are also available). In 2007, the company began selling a wool version, handwoven in Nepal. But you can find similar designs in local markets at a fraction of the price.